Wishcrafter Darcy Merriweather can charm desires into reality, but she won't be able to magically avoid trouble when death holds an open house . . . The Enchanted Village is abuzz when the old Tavistock house finally goes up for sale. 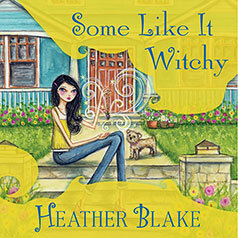 Darcy's friend Curecrafter Cherise Goodwin is hoping she will have the winning bid on the home, but Darcy can't shake the feeling that something bad is about to happen—and her magical instincts are usually right. Sure enough, while Darcy and Cherise are looking at the property, they discover real estate agent Raina Gallagher stone-cold dead on the floor. Clutched in her hand is a gemstone amulet and, on the wall above her, a large red A. While Raina had no shortage of enemies, there's also a dark legend about the house itself. To track down the killer, Darcy must unlock the secrets of both the deceased and the estate—and she'll need to act fast, because revenge is a deal that never closes . . .